It may seem counterintuitive, but the Chinese government’s recent decision to slash major financial support schemes for solar power could end up boosting the industry’s global prospects. The move, announced at the beginning of June, sent shockwaves through the industry, with 20GW of planned solar capacity (50% more than the UK’s total solar capacity) suddenly expected to be scrapped. On the surface, it doesn’t look great for the sector: demand growth in China is set to slow over the next couple of years while many smaller solar companies in the country are likely to suffer (though we understand follow-up policies to relieve those most hurt by the cut are on the way). In the medium-term, however, it could lead to a glut of cheap Chinese panels fuelling a solar boom in neighbouring nations, especially India, and a significant fall in panel prices. The manufacturing side of China’s solar industry has already tooled up, expecting to capitalise on soaring domestic demand, and is unlikely to slow production much. And the mergers and acquisitions likely to follow the government’s change of policy could see the development of a clutch of industry leaders, deploying cost-saving measures and production-line efficiencies at scale. Here’s the thing: China’s subsidies have worked. The solar industry, at home and abroad, is increasingly cost-competitive with other energy sources like coal. It is thriving. Some solar projects in China will even be ready to deal with the cuts, with distributed energy schemes in the country’s east able to maintain a 10% rate of return without subsidy — though the vast majority can’t yet go up against coal on their own. “This policy looks to me to be aimed at curtailing some of the extremely overambitious capital investment expansion plans, with certain solar companies having announced intent to undertake a 100-400% capacity expansion within the next few years. Essentially success bred success and China’s solar sector started aiming so high that it was setting itself up for calamity. Dolf Gielen, Director of Innovation at Technology at the International Renewable Energy Agency (IRENA), said: “Against the backdrop of a potentially overheating market, the Chinese government has taken a step to stabilise domestic solar PV deployment and support sustainable market development. 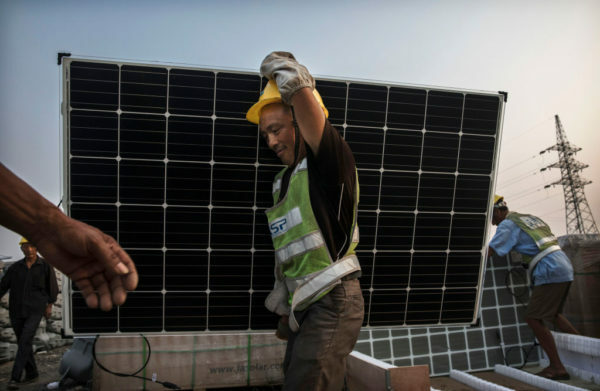 China has its eyes on solar reaching price parity with coal by 2024, an ambition that would have suffered a significant setback had the industry embarked on the kind of subsidy-fuelled expansion it intended to. Buckley said: “I think unconstrained installations like the way-above expectations 53GW in 2017 were causing a massive build up in unfunded solar subsidies. One key benefit will be curbing the waste of solar power. As we’ve previously reported, curtailment is a major problem in China, with the grid often unable to find space for the enormous amount of clean energy created. Building out the grid to better accommodate the country’s thriving renewables industry really is the best use of money at this point. Inter-provincial transmission channels in particular. Another benefit could be essentially thinning the herd. The slowing growth of solar demand will see smaller companies overly reliant on the domestic market bought out by firms with bigger distribution networks and an eye on exports. The huge rise of solar cell manufacturing capacity over the past 18 months isn’t going to be undone. For example, the country’s polysilicon (a vital component of solar panels) production is expected to double this year, with enough capacity to meet *global* demand. So companies are going to keep producing a record amount of solar PV, and everything that isn’t deployed in China will make its way to the global market, with India and its hugely ambitious renewables targets the likely beneficiary. The outlook for the global PV installation in 2018 has fallen from 113 GW to 105 GW, according to IHS Markit analysts, but that’s still 11% higher than in 2017. “As a consequence of a shrinking domestic market it is likely that additional capacity will make its way to the export market, although companies looking to offload high volumes of stock may not necessarily be domestic PV market leaders,” Gielen said. This new state-of-affairs could trigger a dramatic price fall over the next few months, with Bloomberg New Energy Finance forecasting a cost reduction of up to 35% by the end of the year. India, according to Buckley, will see its solar install rate accelerate, from 10GW last year and the expected 7-11GW this year to more than twice from here on out. “Lower module prices will give an immediate boost, so even allowing for a 12-18 month turnaround in new projects, it is quite feasible Indian installs will double to more than 20GW annually from 2019/20. Lower international prices could help counter the solar panel tariffs recently introduced by US President Trump. Gielen said: “There does appear to be a stalemate currently, between overseas buyers and Chinese manufacturers as buyers wait for price reductions and sellers show reluctance to reduce. However sheer oversupply will force prices down soon and intensify market competition. So far this decade global PV installation has increased almost nine-fold, accompanied with 80% dropping of module price. There is no doubt module price will keep go down in 2018, at the cost of manufacturers’ margin. Yet the surging demand outside of China will not fully offset the suppressed within China. This round of oversupply from China could incidentally speed up the uptake of PV technology and completely reshape the global solar supply chain.